Sanctions imposed against Russia by the United States actually began on March 1, 2014, when the United States stopped issuing export licenses on certain products going to Russia. Mars went retrograde on March 1, and that day was a new moon at 10*39’ of Pisces. In the chart for the current constitution of Russia, December 25, 1991 (from astroweekly.com), the position of the New Moon opposed progressed Jupiter. Jupiter is the traditional ruler of Pisces, and thus of the 8th house in this chart, in which the New Moon falls. This opposition formed a Grand Cross with another opposition, that of the progressed Moon at 13* Gemini opposing natal Mercury at 11* Sagittarius. This configuration does show the beginning (New Moon) of changes having to do with finances, and these changes being imposed by an external agent, rather than internally. Saturn was about to go retrograde (it did so on March 2), and was at the same point as natal Pluto and natal Venus, 22* Scorpio, in the 4th house. The 4th house rules property, real estate, mining or extraction of resources from the land. The basis of the Russian economy is the extraction and distribution of oil and natural gas, so these sanctions have the potential to seriously curtail revenue from those sources. 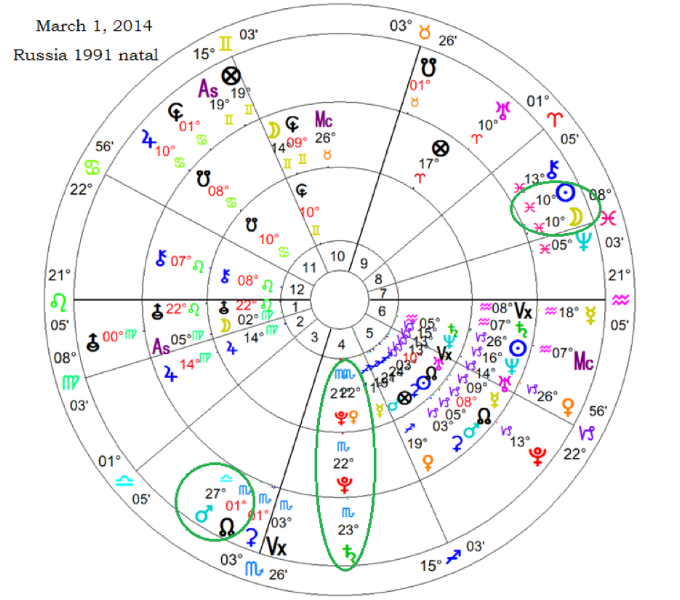 In the 1990 chart used by many Russian astrologers, (for June 12, 1990, when the Russian Parliament declared the sovereignty of the Russian Federation Republic), on March 1, Venus 22* Capricorn is at the same position as natal Saturn in the 4th house, and forms a T-square with the opposition between Mars 27* Libra and progressed Mars 25* Aries. Again, the areas governing finances are involved, the 2nd and 8th houses. Both of these charts show an over-reliance on the energy sector for Russia’s economy, and the events of March 1 indicate a disruption of that reliance. What was soon to unfold is shown by a configuration that formed on May 11, 2014, which was triggered in the early March time frame. On March 1, Jupiter was about to return to direct motion (it did so on March 6). It went direct at 10* Cancer, triggering the May 11, 2014 positions of Venus, Mars, the Moon and natal Mars in the 1990 chart. The May 11 configuration indicates a sudden land grab: Venus 9* Aries at the position of natal Mars, opposing Mars and the Moon at 9* Libra, with all forming a T-square to natal Uranus 8* Capricorn. Russia easily acquired land of a neighboring country with little resistance. On May 20, 2014, Mars goes into direct motion at 9* Libra. At this time, Jupiter opposes progressed Saturn in the 1990 chart, showing satisfied greed. However, with Saturn retrograde near natal Pluto and natal Venus in the 1991 chart, the repercussions of this takeover might not be felt until Saturn goes into direct motion. Aspects to the 1990 chart on March 1, 2014 clearly indicate another event that took place that day: passage by the Russian parliament of two decrees: that Russia is free to use its military in Ukraine; and repudiation of a 1994 agreement between the United States, Britain and Russia that they would recognize and respect Ukraine’s independence and territory in exchange for Ukraine forfeiting its nuclear weapons. The New Moon at 10* Pisces was trine Jupiter 10* Cancer, and square progressed Venus 13* Gemini, in the 9th house. Venus at 26* Capricorn formed a T-square with Mars 27* Libra (back at the degree of its retrograde station) opposing progressed Mars 25* Aries. With Venus, ruler of the 9th house in this chart, and Jupiter, natural ruler of the 9th, the house of laws and courts, involved with the Sun, ruler of the 11th house of parliament, and Mars, ruler of the 8th house and of military action in general, the immediate effect was to intensify the standoff between Russia and the West. March 1, 2014 marked an important turning point in Russia’s long-term foreign relations. The New Moon was in Pisces, ruled by Neptune. Pluto was at the same degree as progressed Neptune in the 1990 chart, and square Uranus. Both Neptune and Pluto relate to the energy sector: Neptune rules oil and natural gas, and Pluto rules their extraction. Both Neptune and Pluto act slowly, but they completely wipe out whatever they act upon; with Uranus participating in the mix, a new form will emerge. Disregard of the 1994 agreement will prove to have serious long-term effects for Russia, eroding the trust of their international partners, and increasing the animosity of their enemies and competitors. It was reported in April that policymakers in the United States had held discussions with big bondholders of Russian debt. The United States has been giving investors time to unwind their positions in Russian debt, but by July 20, 2014, they will start to peel off the velvet gloves, as Saturn returns to direct motion at 16* Scorpio, and Mars will again be at 27* Libra, the point at which it went retrograde on March 1. Saturn rules the 8th house of the 1990 chart, which is the house of debt, foreign investment and shared resources. After July 20, there will be forward movement in this area. Between July 12 and July 21, 2014, Mars will oppose progressed Mars 25* Aries in the 1990 chart, and the Sun at 19* - 28* Cancer opposing progressed Saturn 22* Capricorn forms a Grand Cross. The focus is on Vladimir Putin, leader of the established government, who now finds himself between a rock and a hard place. The 1991 chart also emphasizes the time period of the third week of July, for on July 19, the Sun 26* Cancer opposes the progressed Sun, forming a T-square with Mars 26* Libra. The 12th house is involved here, so events at this time are occurring behind the scenes. As the Sun, Mercury, and Venus move into Leo and conjoin Jupiter in succession, they also oppose progressed Saturn 7* Aquarius in the 1991 chart. Jupiter, the traditional ruler of Pisces which rules the 8th house in this chart, is making a harsh configuration with progressed Saturn, indicating financial restrictions; i.e., more sanctions. This looks to be a progression of sanctions over time, starting with threats and moving into applied sanctions, especially on financial transactions involving entities involved with Russia’s energy sector. On August 18, 2014, the Sun squares natal Pluto and natal Venus in the 1991 chart, while Mercury conjoins the natal Moon and progressed Ascendant, all opposing Neptune (co-ruler of the 8th house), with the Moon on that day forming a T-square with this opposition. This is most likely when new sanctions will take effect. These new sanctions will involve Russian banks and will impact the common people, not just those of Putin’s inner circle. For the near term, expect further sanctions to be imposed on Russia between July 19 and August 26, particularly August 9 to August 18, 2014. The period from September 16 to September 25, 2014, has aspects in the 1990 chart that show a possible retaliatory move by Russia. The Sun and Venus trine progressed Saturn, while Ceres 15* Scorpio conjoins natal Pluto and opposes natal Venus, involving the 2nd and 8th houses. This opposition forms a T-square with Jupiter 13* Leo. Russia may issue a decree that they can increase their access to financial assets beyond their borders. New restrictions may also be placed on businesses in Russia’s energy sector in October 2014, when Saturn 21*-22* Scorpio, now in direct motion, passes over the natal positions of Venus and Pluto in the 1991 chart. October 7, 2014 is a particularly sensitive day, indicating renewed hostility between Mr. Putin and the West.